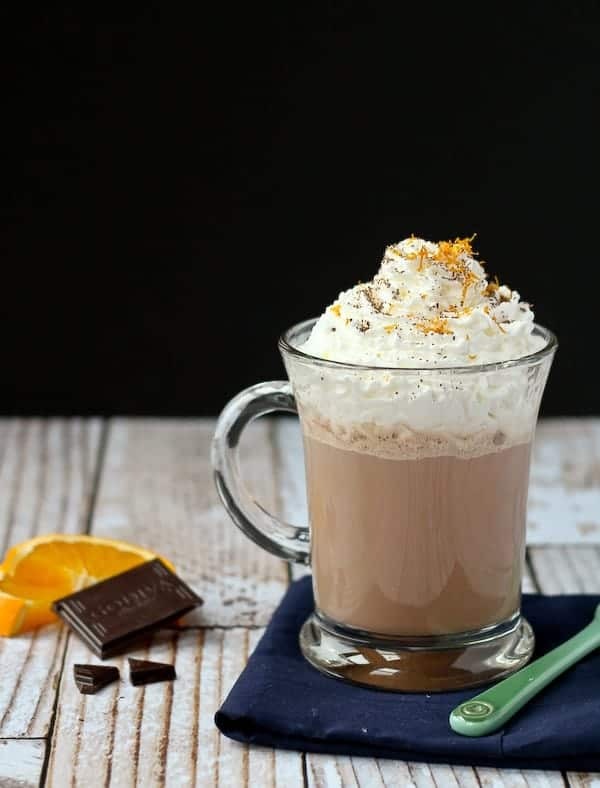 This orange hot chocolate recipe is easy to make – you’ll be sipping flavorful, rich, creamy hot chocolate in less than 15 minutes. January – it doesn’t have to be all about salads. 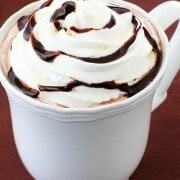 There is nothing better, NOTHING better than warming up with some hot chocolate after being out in the snow. Maybe you just spent an hour shoveling heavy snow. It might be because our house is still fairly new to us or maybe it’s the west Michigan girl in me, but I really enjoy shoveling. You can see the work you’ve done and as a bonus it’s a great workout. And you can go inside and warm up with hot chocolate. Hot chocolate is also a perfect beverage following some snowman building and snow angel making. I have a small mug, a little bigger than an espresso mug, that E drinks cocoa out of. It’s such a special treat and she just glows and smiles ear-to-ear when she gets to enjoy a cup of cocoa with her mom and dad. We’re not talking about a packet of powder that you open up and mix with water here. Oh no no. This is the good stuff. Creamy milk, slowly warmed and then poured over high-quality dark chocolate. If you’re going to treat yourself to hot cocoa, make it worth it. 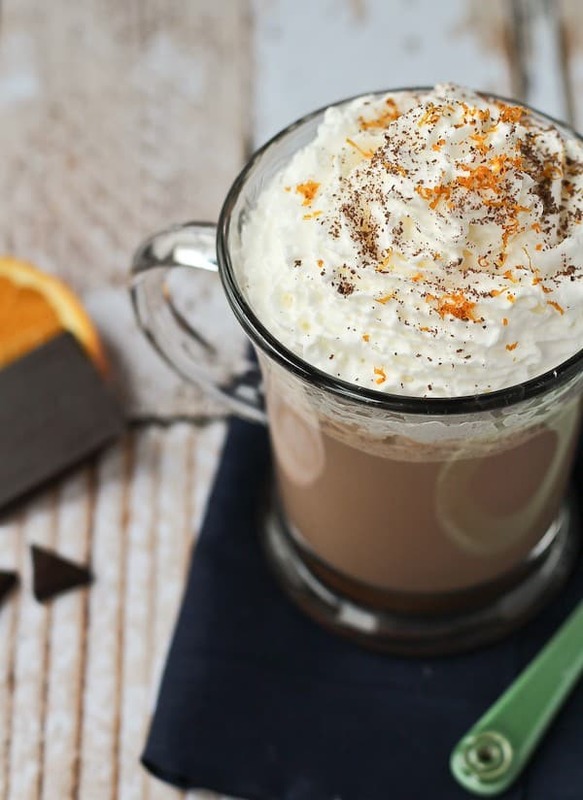 This particular hot chocolate is made extra special thanks to a few strips of orange peel. The orange and chocolate combination works so well together. The orange brightens things up just enough to prevent this beverage from feeling too rich. I added a bit of powdered sugar to my cocoa. Depending on the type of chocolate you use and how sweet you like your cocoa, you may be able to omit the sugar…or you might want to increase it a touch. You can always add more but you can’t remove it, so start with a small amount and work your way up from there according to your tastes. Combine milk, sugar, orange peel in a small sauce pan and place over medium heat. In a small bowl break the chocolate up into small pieces. Stir milk frequently and heat until hot but not boiling. Pour hot milk over chocolate and stir until chocolate is melted. Serve topped with whipped cream, shaved chocolate and orange zest. Note: If chocolate does not melt well (if it seizes), you can save it by blending it in a blender. Verdict: LOVED. Warm, flavorful, creamy, delicious. Loving this orange hot chocolate recipe and looking for more creamy drinks to keep you warm all winter long? 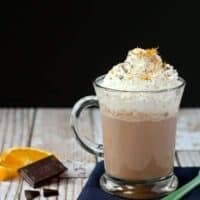 Try caramel cappuccino mix, cardamom-vanilla tea latte, stout hot chocolate, easy hot chocolate or check out this list of FIFTY hot chocolate recipes! **Disclosure: I am thrilled to be in an ongoing partnership with United Dairy Industry of Michigan. 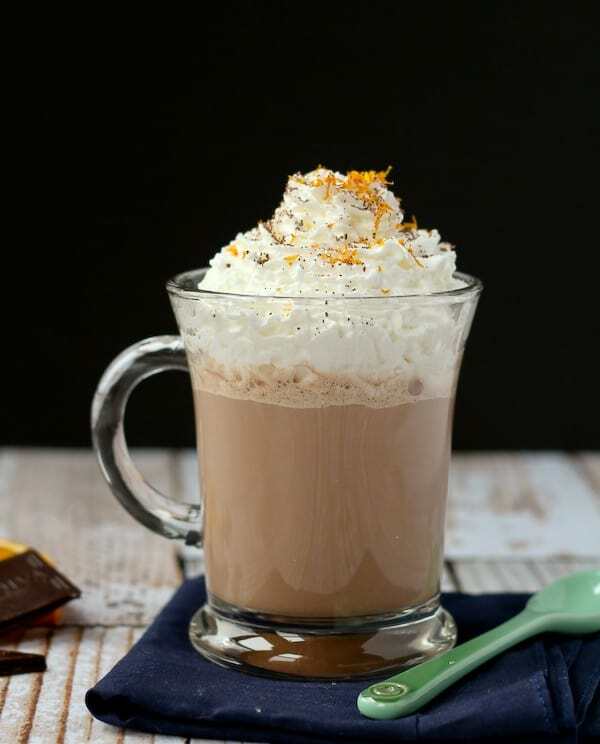 I have been compensated by UDIM for my time to develop this orange hot chocolate recipe. All opinions are as always, my own. Find out more about why Milk Means More on Twitter, Facebook, YouTube and Pinterest. This sounds fabulous, Rachel! I love the combo of chocolate and orange. Can’t wait to try it! I love the bit of citrus with the warm, chocolaty goodness! Sounds & looks perfect! I have some remaining oranges in the backyard – need to whip this up! This is gorgeous! That fresh orange zest is such a great touch! My daughter wouldn’t touch hot chocolate with a 10-foot pole until I finally tried making a super-rich variety with melted chocolate and a little heavy whipping cream! Now she loves it – but when I suggested making it when it *wasn’t* snowing she did not approve. It can only be consumed after being outside in the snow. Good rule, I guess! :) This version looks fabulous – love orange and chocolate together. So cozy. I think hot chocolate is one of my kids’ favorite things about winter. I can’t wait to make this for them!! 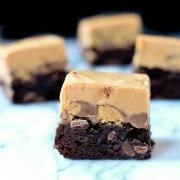 That warm, chocolatey deliciousness is perfect on a cold winter day. Pass me a glass please! Love the bright citrus in this! This looks perfect for a day off from school like today, Rachel! 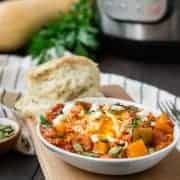 All I want right now is a giant mug of this (and my couch with a blanket)!